Business decisions in a Korean enclave in Tokyo may provide a glimpse into the future of Japan's wired cafe society. Technobahn takes on the big boys in the financial information market. With more than 3,000 inventions to his name, including an early version of the floppy disk, the doctor says he's halfway to his goal. The Net Brings life on a New Zealand farm to classrooms in Kyushu. 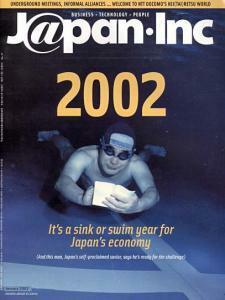 The J@pan Inc editorial team makes some dire predictions as Japan limps into the new year. But several experts help point the way to sectors that are likely to show some life in 2002. Japan's wireless giants have built on the old keiretsu model of corporate relationships to create a much more subtle -- and potentially more powerful -- structure. Are traditional ideas about cars running out of gas? Market Size and The Threat of Saturation..., Competitive Environment and Future Earnings Growth..., 2002 Share Price Trends. Jonathan Allum is a London-based Japan strategist for KBC Financial Products. Allum was previously a Japan strategist for ING Baring Securities, and has 20 years of experience in Japanese financial markets. Investors reassessing Cybird after nearly a year as a listed company are sure to be wondering this: Is Cybird a stock that can fly back towards its peak share price of JPY1.1 million (currently JPY525,000), or is it just another turkey waiting to get gobbled up by the ferociously competitive content market? Sometimes disclosures are only skin-deep -- insights from due diligence performed in the field. Can i-mode play an educational role?